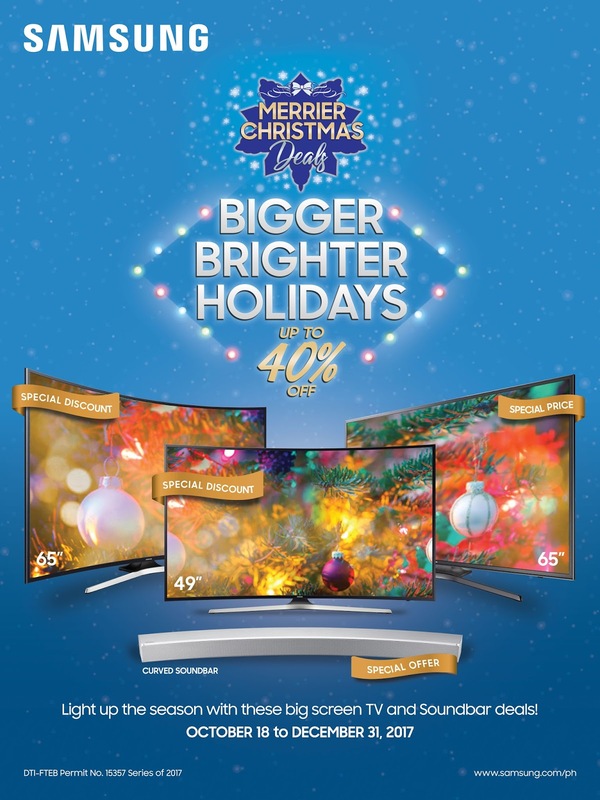 Let Samsung light up your Christmas with its Bigger and Brighter Holidays Promo! It’s beginning to look a lot like Christmas. People are starting to shop for gifts like busy little elves, putting a lot of thought into the items that they will buy for the countless parties they’re attending and using the money they have saved up for months. The weather is a little bit colder and the streets are much merrier, filled with lights and decorations all over. And now, Christmas at home can even be bigger and brighter with Samsung’s wider screen TVs with stunning visuals and vivid color display. Lucky for you, the tech giant’s Christmas deals allow you to get the items you’ve always wanted and still have enough money for all the other gifts that you have to buy. Samsung TV’s Bigger and Brighter Holidays nationwide promo will run from October 18 to December 31. Receive the gift of the best viewing experience while scoring great deals on Samsung’s state-of-the-art home entertainment devices. Get discounts of up to 40% on our Samsung Flat and Curved UHD TVs. Buy a Samsung Soundbar with Dolby Atmos Technology or the Samsung Sound+ Curved Soundbar at a lowered price and get a free Wireless Audio 360 Speaker or Blu-Ray Player, respectively. From November 1 to December 31, enjoy discounts on other flat and curved Samsung Soundbars. Sit back and relax while watching your favorite Christmas films with upgraded 4K picture quality on your Samsung UHD TV. The stunning 4K resolution, which is 4x better than Full HD, will give you an immensely satisfying viewing experience. Meanwhile, spread the holiday cheer as you listen to your favorite tunes with the Samsung Soundbars. Its high-quality audio played by multiple built-in speakers will be a hit at your parties. With Samsung TV’s Bigger and Brighter Holidays Promo, TVs and Soundbars are just one trip to a Samsung authorized dealer near you. Know more about this promo by visiting Samsung Electronics Philippines’ official Facebook page or samsung.com.ph.